For LaTaja Dingle, ?Be the change you wish to see in the world? is more than a popular adage, it?s a way of life. 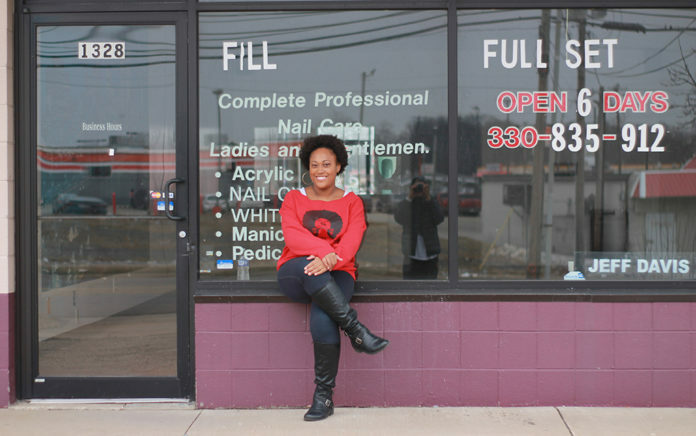 Frustrated by the lack of Black-owned beauty supply stores in her neighborhood in Akron, Ohio, and the lack of knowledge other store owners have about ethnic hair, Dingle decided to start her own business to fill the void; thus the idea for Royalty Beauty Supply was born. When Royalty officially opens for business, Dingle will be the first Black woman to own a beauty supply store in Akron. ?I?m looking forward to what it?ll represent in the community as a small business and a Black owned business.? Dingle says. ?I really want to focus on recirculating the money back into the Black community.? Although the numbers vary, according to recent reports by the Black Owned Beauty Supply Association (B.O.B.S.A. ), the Black hair care and cosmetic industry generates $9 billion dollars in profit both nationwide and internationally, annually, and yet just 78 beauty supply stores in the country are Black owned. Dingle is determined to skew that number in favor of Black empowerment. She explains that Royalty will focus on specialized business-to-business sales for barbershops and salons by offering more affordable prices on items shop owners are already using in their businesses. In addition to beauty merchandise, Dingle also wants to sell toiletries and household cleaning supplies created by Black people, in hopes of one day becoming the largest retail store that sells Black owned products. Dingle currently works as a fraud detection specialist for a financial services company in Akron, and has previously worked in real estate and customer service. Dingle explains that each role has increased her knowledge of financial, organizational and entrepreneurial expertise, which will aide in her impending business plans. For all else that she doesn?t know, Dingle who doesn?t have a business partner, is relying on the assistance of the Beauty Store Institute, in Atlanta, GA, which teaches store proprietors how to launch and successfully operate a beauty supply store. In addition to changing her community, Dingle is also pursuing entrepreneurship to enhance her family?s future. Dingle, who is engaged, is the mother of three children, ages 8, 4 and 4 months. She says that she speaks to her oldest son, 8, often about money and her process of opening a business in terms that he can understand so that he will have a firmer grasp on finances than she did growing up. ?Financial literacy isn?t really taught in the Black community or in the school systems so then we don?t know what to expect as adults.? Dingle explains. ?It?s been an unlearning and relearning process for me.? Armed with ambition and fortitude, there has been one consistent obstacle standing in the way of Dingle?s plans: funding. She initially launched a crowd sourcing campaign via ?Buy the Block,? which didn?t receive the response she hoped for, raising only $8,200 of her $395,625 goal at the time of press. Dingle believes that low awareness about crowd funding for real estate projects among patrons may have contributed to low engagement. But nevertheless, she is persisting and currently seeking an angel investor; and if that doesn?t pan out, Dingle has already secured a business loan that she?s prepared to use if necessary so that she can open Royalty?s doors in June 2018 and then expand to a second location in Akron within the next five years. ?I hope that Royalty will stand as a beacon, so that we don?t have to settle for what?s already there,? Dingle affirms. ?If there?s something wrong with our community or if there?s something missing, it?s up to us to fix it. ?